"He who desires not to use Bernini's designs, must take care not to see them." All photos are of ceilings unless otherwise indicated. All are from Rome. All were taken on my phone, which is an iPhone 4S. And last time I checked, Blogger was crap at jump cuts, but this post has 30+ pictures, so I can't not. After the second picture, click on the link that says "Read more"... or, to see all the pictures, just click here. ETA 1/27/12: Blogger, I hate you. My apologies to anyone whose blog readers were overwhelmed by this post during the time Blogger decided to arbitrarily remove my jump cut! Should be back now. 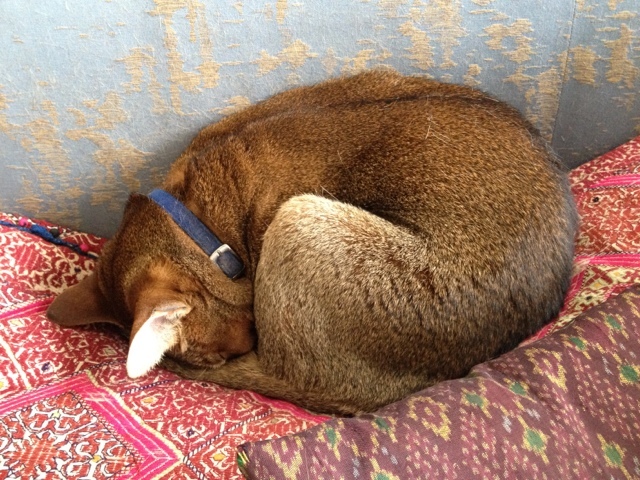 What could possibly be better than Hercules curled up in a ball? Hurcules and Kasa curled up in a ball! 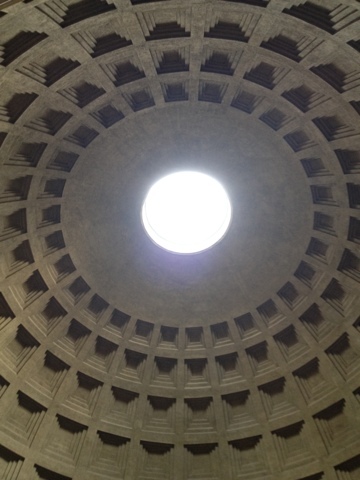 Here's looking up at the (hole in the) ceiling of Rome's Pantheon. The Pantheon has an interesting history to do with pagans that you can read about here. Here's looking down into the bottom of the Pozzo di San Patrizio ("Well of Saint Patrick") in Orvieto. The well has an interesting history to do with popes and mules and double helixes that you can read about here. Here's looking up at the sky from the bottom of the well. 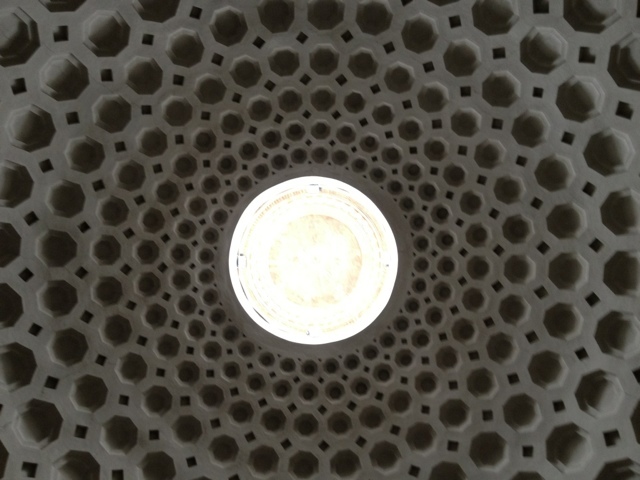 Here's looking up at one of the domes in the church of Sant'Ignazio di Loyola in Campo Marzio in Rome. And here's looking up at a few more in the same church. Are you sensing a theme? Yes, I've been looking up, and looking down, a lot. However, I'VE ALSO BEEN LOOKING SIDEWAYS AND ALL AROUND. Me at the local yummy vegetarian foodie place (Life Alive. Stupid name, delicious food. Also, no, I am not a vegetarian): I'd like the Romantic Wrap. Please add eggs and greens. The guy: The Romantic Wrap, add eggs and beets? The guy: I'm afraid we don't have any beans. Me: GREENS! I WANT GREENS! My sister, codename: Apocalyptica the Flimflammer, on the phone in the wind: I just got to Harvard Square! I'm sorry I'm late! I'm on my way! Me: Oh, don't worry, I'm just doing crap. Me: Crap! I'm doing crap! I'm paying bills and filing paperwork! Apocalyptica: So you're not doing crack? So, travel puts a lot into me, but it also takes a lot out of me, and lately I've been using what I've got for stuff other than blogging. My expectation is that this will result in you someday soon having more fiction by me to read. Fair deal? I'm soaking in as much home as I can right now, because I leave on another trip in ten-ish days. Andersen, Arnold, Leigh Cohn, and Thomas Holbrook. Making Weight: Healing Men's Conflicts with Food, Weight, Shape & Appearance. Carlsbad, CA: Gurze Books, 2000. Campos, Paul. The Obesity Myth: Why America's Obsession with Weight Is Hazardous to Your Health. New York: Gotham Books, 2004. Cash, Thomas. Body Image Workbook: An 8 Step Program for Learning to Like Your Looks. Oakland, CA: New Harbinger, 1997. Dixon, Monica. Love the Body You Were Born With: A 10 Step Workbook for Women. New York, NY: Berkley Pub Group, 1996. Doty, William G. Myths of Masculinity. New York: Crossroads, 1993.